Getting ready to purchase a new couch? As such a large investment, you’ll want to be sure you’re purchasing a couch that is reading to stand up to any challenge you bring its way. At our upholstery cleaning service in NJ, we are proud to be able to offer our customers our trusted do’s and don’ts of couch buying so that you can be sure you’re buying reliable couches. When you begin to look at couch options, you’ll want to take a look at the material and how easy or difficult it will be to keep it clean. Homeowners with kids or pets might want to pass on a white couch for now, while those looking to brighten up a room might choose a lighter couch to create the illusion of more space. Either way, you’ll want to learn exactly how to clean your couch before you purchase it. Do consider the purpose of your sofa. Will you be using your couch as primary seating, watching TV, eating and napping? You’ll want to purchase a couch that is equipped to handle heavy traffic and takes comfort to a new level. Don’t forget to take accurate measurements. Have you ever purchased clothes in a store without trying them on only to find that they don’t fit right once you get home? Purchasing a couch is no different. Use a tape measure to find the exact measurements of your space to ensure that your new couch will fit well when you get it home. Do test your couch before purchasing it. If you’re purchasing a couch for comfort, make sure you lay on it before you make your purchase! Curl up in your favorite nap position in the store to make sure you’ll be comfortable when you go to take your first nap at home. Don’t skimp on a quality couch. 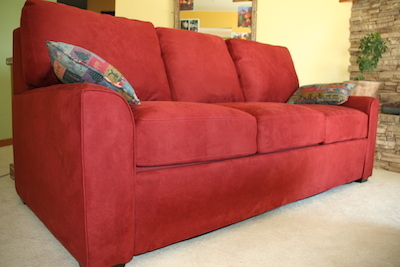 At Best Way Carpet and Tile Cleaning, we often find ourselves looking at couches with a lot of stains. While our routine cleaning services will resolve most of these problems, years of use will result in the need for a refresh. It will be much cheaper to reupholster your current couch than it will be to go out and purchase a new couch in a few years. At Best Way Carpet and Tile Cleaning, we are proud to offer our customers fantastic deals on the services they need to protect their investment. After you purchase your comfortable new couch, ensure that you can keep it safe in clean by enlisting the help of our upholstery cleaning service in NJ. To learn more about our do’s and don’ts of couch buying or to speak with a service technician, we invite you to give us a call at (732) 671-8829. This entry was posted on Wednesday, November 6th, 2013 at 8:43 am and is filed under Upholstery Cleaning.